Ignition lead sets usually consist of four or more ignition leads. 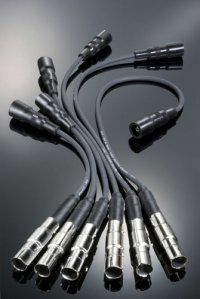 The suppression itself is ensured by material of the conductive cable core (resistance, inductive) or by the suppression resistor nested in the cable terminal (copper core leads). The construction of ignition leads conforms to the requirements for the lowest possible loss of energy during its transmission. The table core insuring the primary way for electric current is manufactured from various materials (copper, resistance, inductive). Braided inner insulation provides electrical insulation and improves mechanical qualities in bend area. External coating protects the core, including insulation, against influence of working environment (protection against oils, petrol, acids, water steam etc.) but also against thermal stress in range from -40°C to +220°C according to the used material (EVA, silicone). Materials used for terminal and boot production match to thermal stress from ignition plug, distributor or coil. TESLA BLATNÁ, a.s. offers ignition lead sets, made of the cables with different material combinations, determining characteristics of the set. TESLA ignition lead sets are identified by the catalog number T001X, that defines the type and colour of the leads of set (see table) and serves as identification for order. Following table explains coding of the ignition lead sets. Concrete description of sets included pdf catalogue sets - specification. This set is designed for Citroen Visa 1.0 - 1.4. New catalogue 2017-2018 with applications of ignition lead sets, ignition coils and COP boots for wide range of car makes and models. Complete catalogue with ignition lead sets.